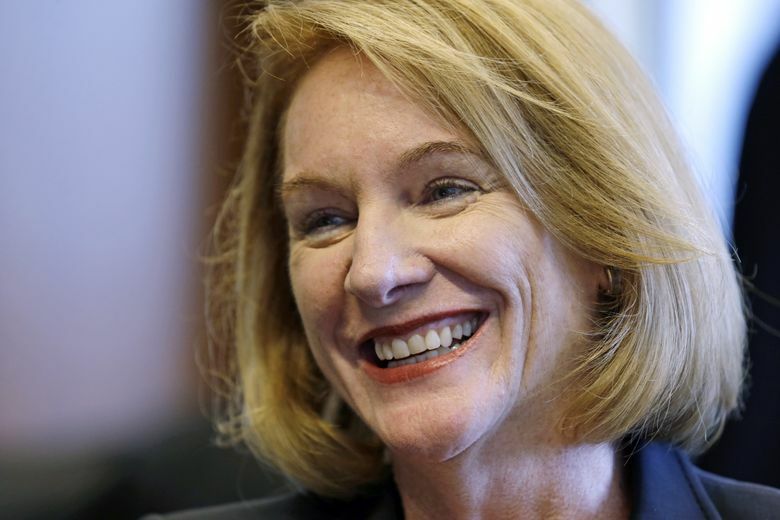 Former U.S. Attorney Jenny Durkan, well-connected in Democratic politics, enters the race days after Mayor Ed Murray ended his bid for a second term. She’s never before run for office, but Jenny Durkan is a political heavyweight who will immediately command attention in a suddenly wide-open race for Seattle mayor. The former U.S. Attorney for the Western District of Washington announced her candidacy Thursday and scheduled a kickoff event for Friday on Beacon Hill. Durkan has been lining up support in recent days, and her entry comes on the heels of Mayor Ed Murray ending his re-election bid this week amid allegations he had sexually abused teenagers in the 1980s. Murray denies the claims. In an introductory essay, Durkan sketched her biography — growing up as one of eight children in an Irish Catholic family (“It was loud”), working as a Teamsters baggage handler in Alaska and later becoming an attorney. “Finally someone is going to pay you to argue,” her mother told her after she finished law school, according to the essay. Durkan also stressed her Seattle roots — her favorite Sonics players and dressing up as a Rainier Beer bottle in a television commercial. And she noted she created a civil-rights unit in the U.S. Attorney’s Office to combat housing and job discrimination. The 58-year-old has been an insider in Washington state’s Democratic Party and is a close friend of and adviser to former Gov. Chris Gregoire. Before the claims against Murray surfaced last month, he had an inside track to a second term. Former Mayor Mike McGinn, state Sen. Bob Hasegawa, attorney and activist Nikkita Oliver and urban planner Cary Moon are among the top names in a growing field of about a dozen candidates. The official candidate-filing week begins Monday. Before becoming a prosecutor, Durkan was a criminal-defense and civil-case lawyer who specialized in defending people accused of white-collar crimes. She represented Microsoft co-founder Paul Allen in a case involving a cable-TV company controlled by the billionaire and also the family of a retired Seattle firefighter killed by a man released from the King County Jail. In politics, Durkan worked for Gov. Mike Lowry, helped Gregoire become governor and served Gregoire as a legal and strategic adviser. In an interview Thursday, Gregoire said Durkan would be a reliable leader for a time made uncertain by Donald Trump’s election as president and Murray’s abrupt departure from the race. “We need somebody who is steady, who is going to come in and take the reins and get going and make sure we’re tackling the biggest issues,” Gregoire said. The daughter of Martin J. Durkan Sr., an influential state legislator who went on to become a powerful lobbyist, Durkan was believed to be the first-ever openly gay U.S. attorney. A sister, T. Ryan Durkan, is a leading Seattle land-use attorney, and a brother, Martin “Jamie” Durkan Jr., is a longtime lobbyist and consultant. Those ties could help the first-time candidate scoop up support from some of the business leaders and big-money donors who helped Murray win election in 2013. But some opponents may portray her as not progressive enough for Bernie Sanders- loving Seattle and as the “establishment” candidate. Durkan had a meeting with business leaders this week that was hosted by Allen’s real-estate firm Vulcan. She’s also met with union leaders. “Based on the early framing, I think she’s looking to hold the moderate position Mayor Murray came into office with while also pushing left,” said Marco Lowe, a Seattle University politics professor who worked in the McGinn administration. Durkan did not make herself available for an interview Thursday. Jenny and Jamie Durkan took opposite sides in a colossal political clash, when she represented the Democrats in their fight to preserve Gregoire’s narrow 2004 election against a Republican legal challenge and he supported GOP candidate Dino Rossi. Durkan is one of Washington’s most effective Democratic lawyer-operatives, said Chris Vance, who was GOP state chair at the time. But other than political insiders and some older voters familiar with her late father, she’s relatively unknown, Vance said. “Those of us involved in politics know the Durkans. The voters don’t,” Vance said. As U.S. attorney, Durkan helped then-Attorney General Eric Holder shape the Obama administration’s response to the emerging threats of cyber crime and terrorism. In high-profile cases, Durkan prosecuted two men for plotting a terrorist attack on a Seattle military-processing center and extradited a hacker — the son of a Russian parliamentarian — on charges of stealing millions of credit-card numbers. In a 2011 letter to then-Gov. Gregoire, she warned against passage of an effort in the state Legislature to legalize medical-marijuana dispensaries and growers. In 2012, her office went after anarchists, saying a group had traveled from Portland and attacked Seattle’s William Kenzo Nakamura U.S. Courthouse on May Day. Durkan pushed for change in the Seattle Police Department, requesting — along with the American Civil Liberties Union of Washington and representatives of 34 community groups — a U.S. Department of Justice review. After officers were found to be using excessive force, Durkan worked on the settlement that has mandated reforms. She clashed with McGinn on issues such as the city’s Community Police Commission and had stern words for officers who resisted the changes. “Reform is underway. Get on the train, or leave,” she said in 2014 after a group of more than 100 Seattle police officers sued in federal court, claiming the new use-of-force policies had hampered their work, endangered them and emboldened criminals. She stepped down as U.S. attorney later that year and now heads the Seattle office of the international law firm Quinn Emanuel Urquhart & Sullivan. Durkan opened the Seattle office and also chairs the firm’s cybersecurity and data-protection group. FIFA, the international governing body of soccer, hired Durkan in 2015 to represent the organization as it dealt with a massive corruption scandal.